This fantastic Golf Course just outside of Oslo, Norway. Is available to green-fee players. 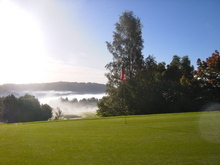 If you travel Norway, golf courses like this one are found all over. Vacation in Norway, makes as much sense as golf does. If you haven't tried, you don't know what you're missing.